Comm Eye Health Vol. 25 No. 79 & 80 2012 pp 65. Published online 05 February 2013. A tonometer is an instrument for measuring the intraocular pressure (IOP), the fluid pressure inside the eye. It is an important test in the evaluation of patients with glaucoma, as damage to the optic nerve is more likely to occur in patients with high IOP. Most tonometers are calibrated to measure pressure in millimeters of mercury (mmHg). Goldmann tonometry is considered to be the gold standard test for IOP and is the most widely accepted method. A disinfected prism is mounted on the tonometer head and placed against the cornea. The force applied to the tonometer head is then adjusted using a dial connected to a variable tension spring until the pressure in the eye can be determined from the force applied (see page 60 for a detailed description of how to use a tonometer). Tonometers in busy clinics have been shown to lose accuracy within months of purchase or calibration by the manufacturer. They are more likely to deviate into the positive range, resulting in higher IOP measurements. It is essential that all eye units develop protocols for calibration checks. Ideally, tonometers should be checked for calibration errors on a monthly basis by individuals who can be held responsible for ensuring their accuracy. Figure 1. Calibration at dial position 0. © Ismael Cordero. Figure 2. Construction of Goldmann tonometer. © Ismael Cordero. The following is the suggested user-level calibration verification procedure for a Goldmann tonometer. 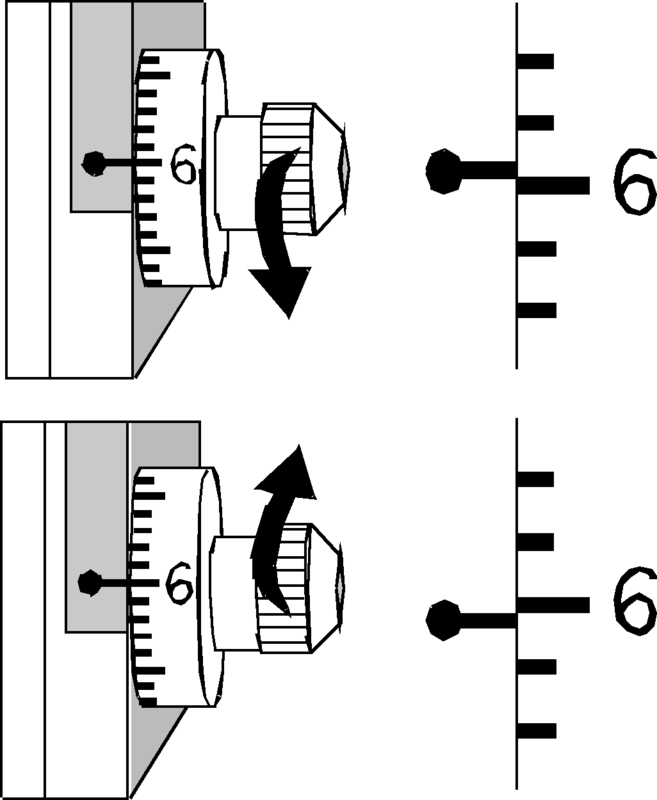 Calibration is done at dial positions 0, 2, and 6 (equivalent to 0, 20, and 60 mmHg, respectively). Please note that this procedure is only intended to verify the accuracy of the instrument. 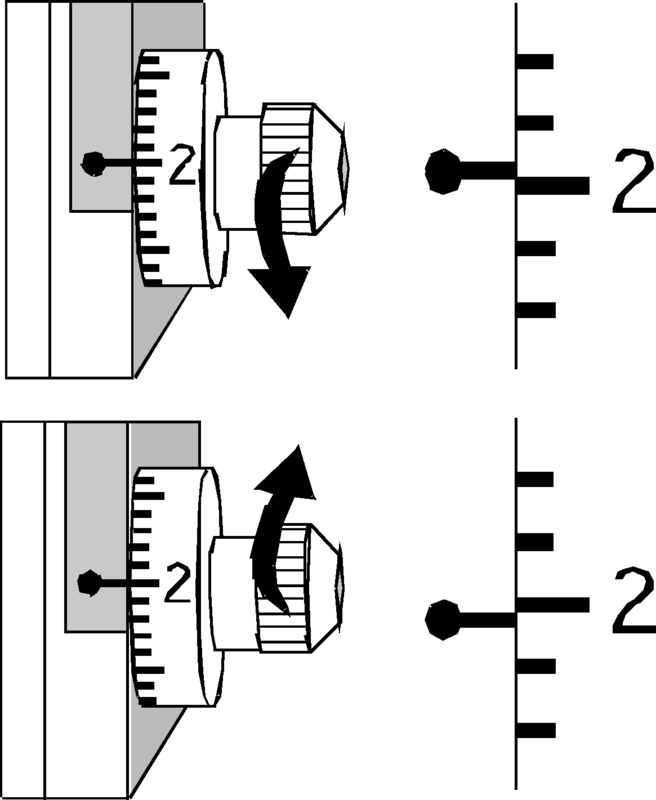 If the tonometer is inaccurate at any of these dial positions, it should be returned to the manufacturer for recalibration. Insert the prism in the prism holder on the tonometer head and place the tonometer on the slit lamp. If the arm does not respond in the above way, the tonometer is inaccurate at dial position 0. Line up the adjustable holder with the lines representing either the ‘2’ or the ‘6’ mark on the weight. 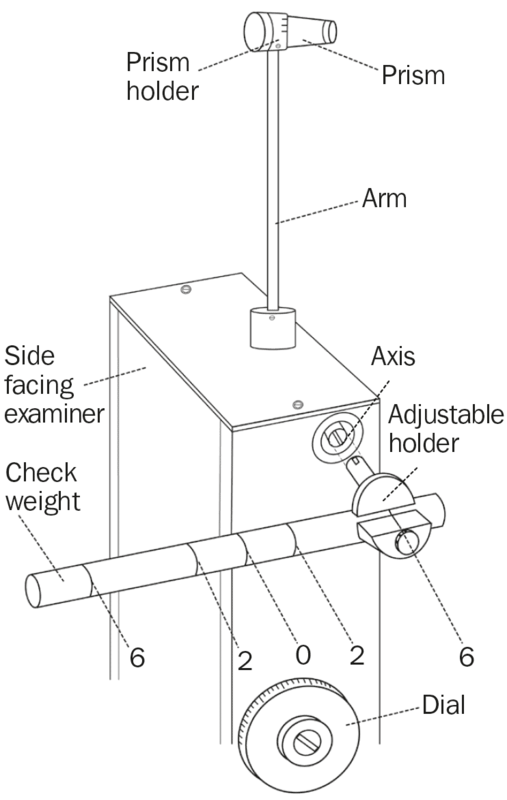 With the longer end of the bar facing the examiner, slide it into the axis on the side of the tonometer and push it all the way in (Figure 2). Figure 3. Calibration at dial position 2. © Ismael Cordero. Figure 4. Calibration at dial position 6. © Ismael Cordero. Check that the adjustable holder is lined up with the line representing the 2 mark (Figure 2) and that the longer end of the bar is facing the examiner. If the arm does not respond in the above way, the tonometer is inaccurate at dial position 2. Check that the adjustable holder is lined up with the line representing the ‘6’ mark (Figure 2) and that the longer end of the bar is facing the examiner. If the arm does not respond in the above way, the tonometer is inaccurate at dial position 6.